Designed for power users who demand a lot from their phones. The 6873 offers executives a large 7” touchscreen display, support for today’s, and tomorrow’s, high-speed networks through dual Gigabit Ethernet ports with embedded Bluetooth and a powered USB port for headsets. 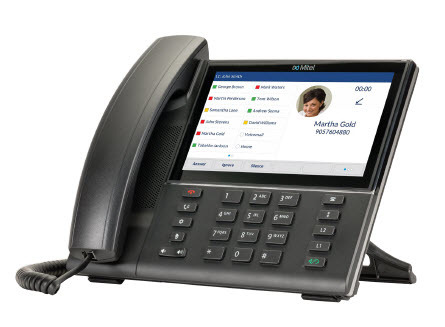 Providing remarkable HD wideband audio, an enhanced speakerphone, and advanced audio processing, the Mitel 6873 SIP Phone will deliver crystal clear hands-free conversations. Compatible with Avaya, Cisco, Alcatel, Nortel, Aastra, IPC treasury, NEC, Siemens, Asterisk, and Mitel. Record Analog, Digital and IP Phones. Agents Evaluation Feature and Quality Management Module.